Most coaches and athletes are aware of what heart rate variability (HRV) is but not until recently is this quantitative variable being used to completely monitor an athlete’s life in order to optimize performance. The sport science research field has begun to head in the direction of validating HRV mobile technology applications and examining the effect constant HRV monitoring may have on sport performance training. Recently, HRV has been validated as a useful parameter for a coaching team to use in order to monitor fatigue and exercise intensity, which has multiple training implications. These new technologies will aid to prevent overtraining while allowing group/team training to become more personalized. 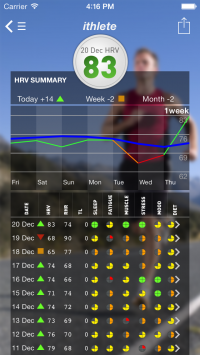 It’s important to understand exactly what HRV is and how it is different from heart rate (HR) measurements, because both are now being used to monitor performance. HR is measured in beats per minute and is literally just that: how many times the heart beats in one minute. It’s a very instantaneous, simple, and noninvasive measurement, which makes it very convenient for monitoring effort and intensity in the field with just a stopwatch. HRV is the consistency in the amount of time between each heartbeat and can be calculated by measuring the R-R interval in the QRS complex. Fluctuations in HRV reflect the changes in the autonomic nervous system (ANS), which consists of the parasympathetic and sympathetic nerves, during exercise. The sympathetic nervous system increases heart rate at the beginning of exercise (therefore shortening and regulating R-R intervals), whereas parasympathetic nerves are responsible for reducing heart rate in recovery. These two systems are constantly working with and against each other in order to control heart rate, and together create an interesting opportunity for sport scientists. An athlete is not “at rest” and fully recovered until the HRV is back at baseline (increased parasympathetic activity), specifically in the morning after an intense training day or competition. As it sounds, HRV requires slightly more calculation and knowledge than HR, which has limited its usage in the field until recent technological advancements. Upon waking up in the morning, the athlete will feel one way, soreness and fatigue wise, and theoretically the HRV data from the monitoring tool will display that same feeling numerically. If the HRV is lower than normal, the athlete is still not fully recovered and therefore should not complete a vigorous intensity workout in order to avoid over training. This is where coaches would need to trust the technology and alter the planned workout accordingly. This could mean that some members of a team are doing a different, or modified, workout compared to others who may have woken up with an increased, or unchanged, HRV. Research has shown that morning resting HRV is one of the best indicators of physiological recovery, and therefore should be a main consideration in planning a periodized training plan (Plew et al., 2013b). However, since there are so many other variables contributing to HRV, such as environmental and emotional considerations, a longitudinal monitoring system may be more accurate. Not all research has been consistent for the validity and reliability of HRV monitoring alone in training, therefore, a systems based approach to monitoring each individual player may be more appropriate and accurate. As Pyne and Martin (2011) state, “a systems-based approach that integrates well-chosen diagnostic tests, with smart sensor technology and a real-time database and data management system, is the future for fatigue management in elite sport.” Dr. Mike Young, during his time as the Fitness Coach for the Vancouver Whitecaps, did exactly this. He created a “biologically dictated periodization” training program based off of a weighted multi-measure monitoring system, which included variables such as: travel stress, strength training load, game load, sleep scores, RPE, GPS, accelerometer, and HRV (Young, 2014). The model would then calculate a player readiness number and suggest levels for training or necessary time off (Young, 2014). The training can then be altered based on this output for each individual player, personalizing each day all the way throughout the season. Another application of HRV monitoring is similar to the way HR and heart rate recovery are currently used, by instantaneously offering evidence of training load. Internal load for every player on each team is going to be variable on an individual basis depending on prior recovery, aerobic capacity, and his/her participation in the training session. With HRV monitoring, this discrepancy can be viewed by a coach almost immediately, allowing the coach to make a decision to extend the training for an individual whom had a lower apparent training load than others. Are there negatives to this type of monitoring? Although there is extreme potential in these types of multi-system based monitoring programs to optimize training and performance, a strong base of sport science knowledge is necessary for the coaches in order to understand and apply it effectively. If done correctly, it can greatly increase the opportunity to train optimally for individual athletes in a team setting. If a coach finds this type of technological monitoring too overwhelming and time intensive, then at the very least, some form of HR and/or wellness questionnaires should still be utilized to better understand how their team is feeling. In fact, changes in HRV were only shown to be slightly (r=0.76) more correlated with a 10-km running performance compared to changes in HR (r=0.73), so this suggests that HR may be just as helpful in monitoring training as HRV would be (Plews et al., 2013a). When this very close correlation between HR and HRV is combined with the ease and simplicity of HR data collection, it may be the best solution for many coaches out there, at least to start with. • Flatt, AA. 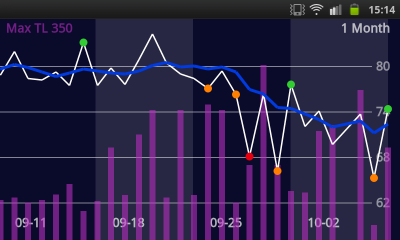 & Esco, MR. Validity of the ithlete smart phone application for determining ultra-short-term heart rate variability. Journal of Human Kinetics. 2013;39:85-92. • Parrado, E., Garcia, MA., Ramos, J., Cervantes, JC., Rodas, G. & Capdevila, L. Comparison of Omega Wave System and Polar S810i to detect R-R intervals at rest. Int J Sports Med. 2010;31(5):336-341. • Plews, DJ., Laursen, PB., Kilding, AE. & Buchheit, M. (2013a). Evaluating training adaptations with heart rate measures: a metholodgical comparison. Int J Sports Physiol Perform. 8, 688-691. • Plews, DJ., Laursen, PB., Kilding, AE. & Buchheit, M. (2013b). Training adaptations and heart rate variability in elite endurance athletes – opening the door to effective monitoring. Sports Med. 43, 773-781. • Pyne, DB. & Martin, DT. Fatigue-Insights from individual and team sports. In: Marino FE, editor. Regultion of fatigue in exercise. New York: Nova Science; 2011. pp. 177-185.